The Obama administration denounced as illegal a planned weekend referendum by pro-Russian insurgents pushing for autonomy and independence for portions of eastern Ukraine, as skirmishes continued in several towns with Ukrainian forces trying to retake ground in the region. Secretary of State John Kerry said Tuesday the referendum set for Sunday would be "bogus" and not recognized by the West. In the first significant statement by Russia's leader which could be interpreted by the West as an effort to ease the tensions in eastern Ukraine, President Vladimir Putin said Wednesday that the referendum on autonomy in southeast Ukraine should be postponed. In a meeting with Swiss president Didier Burkhalter, Putin also called on Ukraine's military to halt all operations against pro-Russia activists who have seized government buildings and police stations across at least a dozen towns in eastern Ukraine. In March, Moscow supported an independence referendum in the Ukrainian peninsula of Crimea, which led to its annexation by Russia. Leaders of the anti-government movement say they plan to hold a referendum on autonomy in the areas of Donetsk and Luhansk, although no preparations for the vote have yet been seen. In Ukraine, meanwhile, Ukrainian troops tightened a security cordon around a major insurgent-held eastern city but pro-Russia militias acted with impunity elsewhere in the turbulent region bordering Russia, surrounding a major Interior Ministry base and reclaiming a town hall in another city. CBS News correspondent Clarissa Ward reported that the town hall in the city of Mariupol changed hands twice in the space of just about 12 hours. Ukrainian state forces recaptured the building late Tuesday, only to peacefully walk away and allow pro-Russian insurgents to reclaim the site on Wednesday after being harangued by locals. Ward was there Wednesday morning as locals gathered around the building and began shouting at the Ukrainian forces, asking "why are you doing this... why do you not support the people?" and calling them fascists. Suddenly, Ward said the police and soldiers simply filed out. The crowd erupted in applause. Somebody climbed up onto a flagpole, removed the Ukrainian flag hung just the night before and posted a Russian one in its place. She said the mood was one of triumph -- and there was no doubt that the crowd gathered around the town hall wanted to see the referendum go forward, raising a lot of questions about the success of Ukraine's military offensive in the region. On Tuesday, Ward met retired coal miner and local insurgent commander Petrov Nikolaivich in the nearby city of Luhansk. He said he didn't want Luhansk to become part of Russia, but insisted the Sunday referendum must be held to determine whether Donetsk and Luhansk should become independent republics. Asked why he felt a referendum was so important, Nikolaivich told CBS News it was needed to safeguard "freedom and faith... and the Fatherland." Ward noted that while the referendum was scheduled for Sunday, with the security situation in the region so tenuous and moving around it so difficult, it was hard to fathom how such a vote could happen. She said it wasn't even clear whether ballots had been printed for the touted vote, or if it was really more of a symbolic gesture of defiance against the Ukrainian presidential elections scheduled to take place later this month. "We flatly reject this illegal effort to further divide Ukraine," Kerry told reporters after meeting at the State Department with EU foreign policy chief Catherine Ashton. "Its pursuit will create even more problems in the effort to try to de-escalate the situation." He added: "This is really the Crimea playbook all over again, and no civilized nation is going to recognize the results of such a bogus effort." 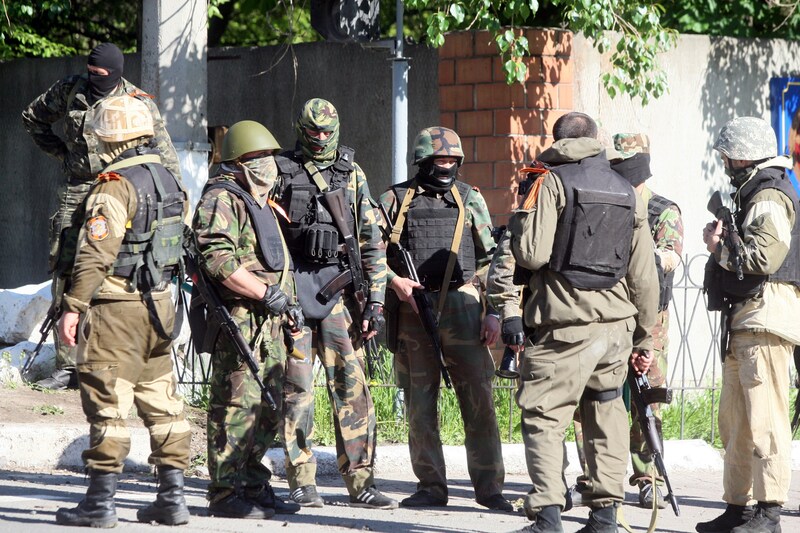 Thirty pro-Russia insurgents and four government troops were killed Monday in operations to expunge anti-government forces around the city of Slovyansk, Ukraine's interior minister said Tuesday. Rebels said 10 people -- fighters and civilians -- were killed by Ukrainian troops during clashes Monday. They would not elaborate and there was no immediate way to reconcile the figures. Gunbattles on Monday around the city of 125,000 were the interim government's most ambitious effort to date to quell weeks of unrest in Ukraine's east. In a statement released Wednesday, the Russian Foreign Ministry demanded that Kiev stop "the use of force against its own people". "The illegitimate authorities in Kiev go on crudely trampling on widely-recognized rights, with the connivance of their Western patrons," the ministry said, according to the Reuters news agency. Although Russia has de facto control over Crimea, few nations recognize the move. The United States and Europe have hit Russia with sanctions over the annexation and Moscow's continued destabilizing actions in mainly Russian-speaking east Ukraine. In a nod to the West's refusal to recognize Crimea as part of Russia, State Department spokeswoman Jen Psaki on Tuesday responded to a reporter's question about a potential visit to the region by Russian President Vladimir Putin by saying: "I hope he enjoys his visit to Ukraine." Will Ukraine elect a new president on May 25? U.S. officials have said all Ukrainians should vote on their future governance in the nationwide elections set for May 25. In his remarks Wednesday, Putin said the upcoming presidential elections were a move "in the right direction," but repeated that constitutional reforms would have to precede any nationwide vote in Ukraine. President Obama and German Chancellor Angela Merkel said last week they'd move to impose harsher sanctions against Russia if it seeks to disrupt the elections. Testifying before the Senate Foreign Relations Committee, the top U.S. diplomat for Europe, Victoria Nuland, said Tuesday that Russian recognition of another separatist referendum and Russian peacekeepers entering Ukraine would be triggers for the sanctions. If "broad swaths" of Ukraine cannot hold elections, she said, that might be another. Both Kerry and Ashton lambasted Russia for failing to abide by an agreement to de-escalate tensions in the east and threatened that any move by Moscow to annex additional parts of Ukraine would be met by new sanctions. Such sanctions, they said, would go beyond penalties already imposed on Russian officials and executives close to Putin and apply to entire sectors of the Russian economy, such as defense, finance and energy.